Move over, Rover, Rowdy is now the name of choice for dogs with cred as world travelers. 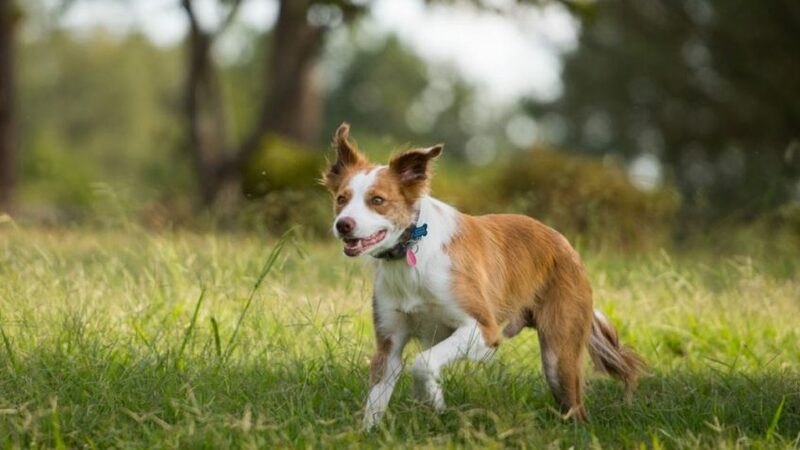 That’s because of Rowdy, a lively two-year-old border collie who has given his owner, Chelsea Brown, an amazing story to tell. 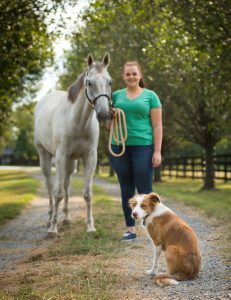 Rowdy and Chelsea live on a farm near Oxford, North Carolina, where Chelsea keeps show horses that she rides competitively. She and Rowdy are inseparable companions, going virtually everywhere together. Until last Fourth of July, anyway. Chelsea and Rowdy were out together in a field on the farm when some neighbors decided to celebrate our nation’s independence with some fireworks. Noisy fireworks. Startled, Rowdy’s fight-or-flight instincts kicked in, and he took off running in a panic and disappeared. Now, remember that this is in the country. It wasn’t that unusual for Rowdy to go exploring for a while, always eventually to return home, so Chelsea wasn’t too concerned about him coming back safely after he got over his adrenaline rush. But when the hours turned into days, Chelsea grew increasingly worried. “Because Rowdy is always with me, everybody in a 25-mile radius of Oxford knows who he is,” Chelsea says. So she and her mother put up some flyers about Rowdy going missing in hopes that a neighbor had found him somewhere and taken him home for safekeeping. Everyone who knows Rowdy was helping with the search. But when that yielded no results, the Brown family began to think that something much more serious was going on. Little did they know. The scene shifts to two women in a car looking for a gas station. As they find a place to refuel, they notice an injured animal beside the road. A border collie. The dog is malnourished and its right rear leg is badly broken. A bone protrudes from the injury. But now fortune smiles on this dog, because these are kindly strangers. They pick him up gently and take him to a nearby veterinarian’s office. The location is Greensboro, North Carolina — more than 80 miles from Oxford. Meanwhile, on the Brown farm Chelsea has gone to bed early. She has to get up at 4:00 a.m. to arrive on time for her job in Youngsville. But she is having trouble sleeping. When the phone rings at midnight, she’s still awake. It’s the waning moments of Sunday, July 24 — almost 21 days since the last time she saw Rowdy. The call is from a veterinarian’s office in Greensboro. Fortunately, Chelsea had an identification microchip implanted in Rowdy, and they have identified Chelsea as the injured dog’s owner. She’s told that Rowdy has been found but his right hind leg is so badly damaged it may need to be amputated. The vet says the situation is very serious, and he recommends that Chelsea take Rowdy to the NC State Veterinary Hospital, where they have the skill and resources to get the best possible outcome. So she and her parents jump in the car and head straight to Greensboro. Sleep can wait this night. 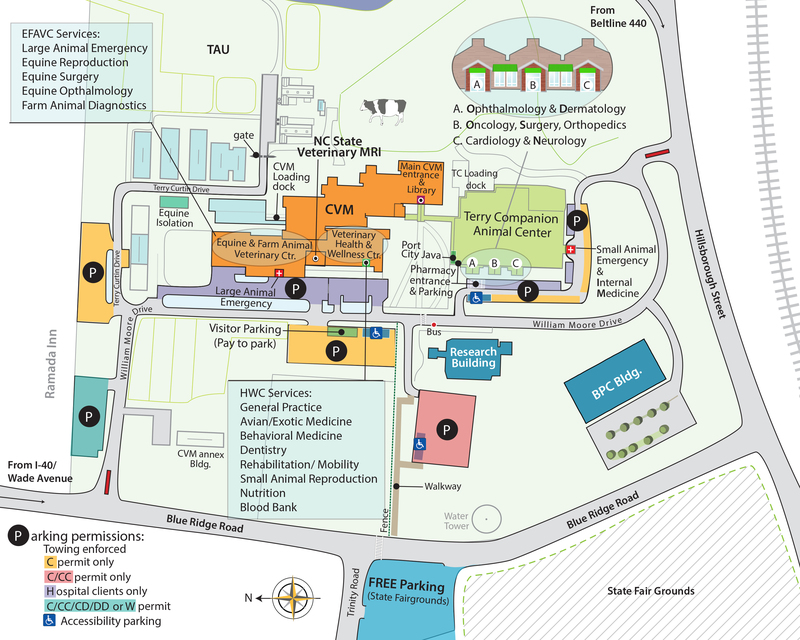 After an all-night drive from Oxford to Greensboro to the NC State Veterinary Hospital in Raleigh, the Browns arrived with Rowdy somewhere between 4:00 and 5:00 a.m. While they dozed in a waiting room, orthopedic surgeon Dr. Andrea Tomas and surgery resident Dr. Willemijn Hoorntje evaluated the injury. It was several days old, and they determined that the bone was partially dead and would not be able to heal if an effort was made to repair the break. Chelsea and her mother were informed that the leg would, in fact, need to be amputated. Soft tissue resident surgeon Dr. Anna Dunlap, reporting to senior clinician and assistant professor of Small Animal Soft Tissue and Oncologic Surgery Dr. Marije Risselada, performed the surgery. Otis, Chelsea and Rowdy. Photo by Nathan Latil/NC State Veterinary Medicine. At any rate, after an extra day of recovery from surgery, Rowdy was released to go home on Wednesday. Incredibly, as the Browns were picking up Rowdy, they were also dropping off Chelsea’s number one show horse, Otis, suffering from a gastrointestinal problem. Otis, too, had to undergo surgery at NC State’s Equine Hospital. Happily, the frenetic flurry of activity paid off for all concerned. Today both Rowdy and Otis are as good as new. Even with just three legs, Chelsea reports that Rowdy doesn’t miss a beat. He still goes with her everywhere. “He even jumps into my truck the same way he did before,” she says.